The logo, mascot and the website for the 13th Conference of Parties (COP) was launched by the Union Minister for Environment, Forests and Climate Change Harsh Vardhan. 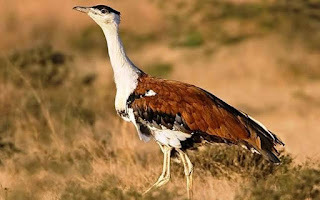 The mascot for the event, Great Indian Bustard has been fondly named as 'Gibi'. CMS is an international treaty under the aegis of the United Nations Environment Programme (UNEP). It is also known as the Bonn Convention. CMS aims to conserve terrestrial, marine and avian migratory species throughout their range. The convention provides a global platform for deliberations on the conservation and sustainable use of migratory wild animals and their habitat. The convention was signed in 1979 at Bonn (hence the name Bonn Convention), Germany and entered into force in 1983. Since its entry into force, the membership has grown steadily to include over 120 Parties from Africa, Central and South America, Asia, Europe and Oceania. Q. The Union Government has announced what as the mascot for the 13th Conference of Parties (COP) of the UN Convention on the conservation of migratory species (CMS) to be held in Gujarat next year?